I think of myself as a pretty down-to-earth person. Well, except when I’m in my own little world, writing about wild, little imps and zombies. Possibly Bigfoot–though really, I could be right about Bigfoot. Anyway, the point is, in the real world, I’m sort of a cross between somewhat open-minded and cynical. So I was not expecting to ever see my sorely-missed but definitely-departed friend. It was such an unusual and intense experience that I wrote down everything I could remember. And when Chicken Soup for the Soul had a call out for stories of “signs from beyond, amazing connections and love that doesn’t die,” I knew I had to send in my story. 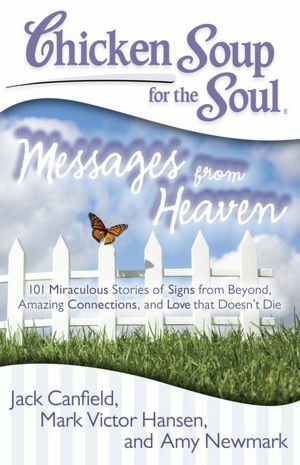 I received my copies of Chicken Soup for the Soul Messages from Heaven in the mail last week. And the very first copy went to the husband and daughters of my sorely-missed friend. I think they liked the story, although they sounded a bit teary. Of course, I understood completely. I can’t read that story without tearing up, even after all these months. Because sometimes, things happen that we can’t explain–and the world, and how we see it, is never quite the same. ← Where in the (Blog) World is Cathy C. Hall? Congrats! There are a few people I’d sure like to see again, even if just for a moment. *sigh* I wish. . . .
Just hearing about your experience makes me tear up. How special your story must be to your friend’s husband and daughter, and what a wonderful way to keep her memory alive. Donna, I had not been able to tell them about the visit, but when the book came, I said, “Here-there’s a story-” and pushed the book at ’em. So proud to share this publication with YOU, Cathy. We should go on tour. Congratulations, Cathy! I can’t believe you waited a week to tell us. 🙂 I would never be able to show such restraint! The book looks great and I can’t wait to read your story. It’s extra nice when it’s one that’s so meaningful.